After an unexpected week off due to my being sick I'm back with the newest collection from a favorite brand favorite of mine, Cult Nails. 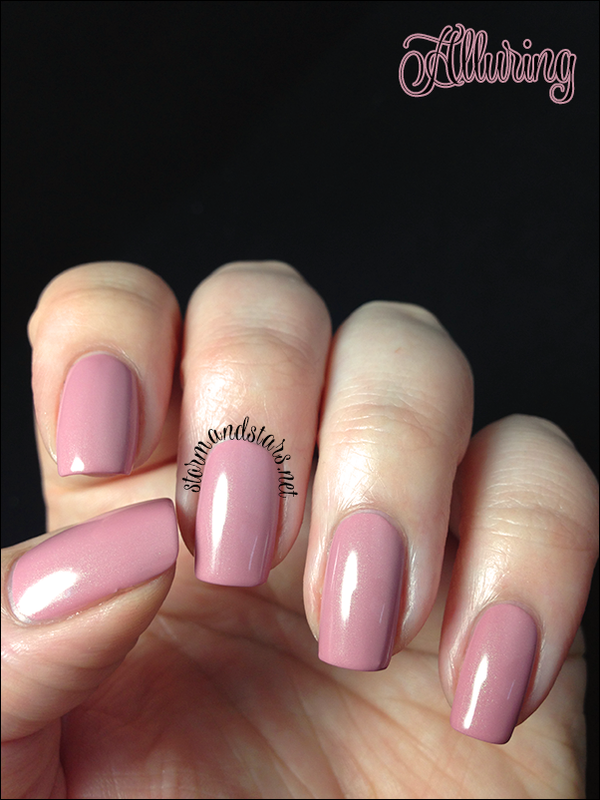 Maria from Cult Nails has some great ideas when it comes to polish and her latest venture is teaming up with other small brands to bring you samples and coupon codes with your preorders. This month, in addition to the Spring Radiance Collection, I received cuticle oil samples from Sweet Baby by Donna to try out. If you know me and have been reading my blog, you'll know I already use and love Donna's products, but now I have a sample of each of her fragrances, which is really great! First I'm going to show you the polish and then I'll get to the cuticle oils. First up for polish is the beautiful, Radiance. Gah! 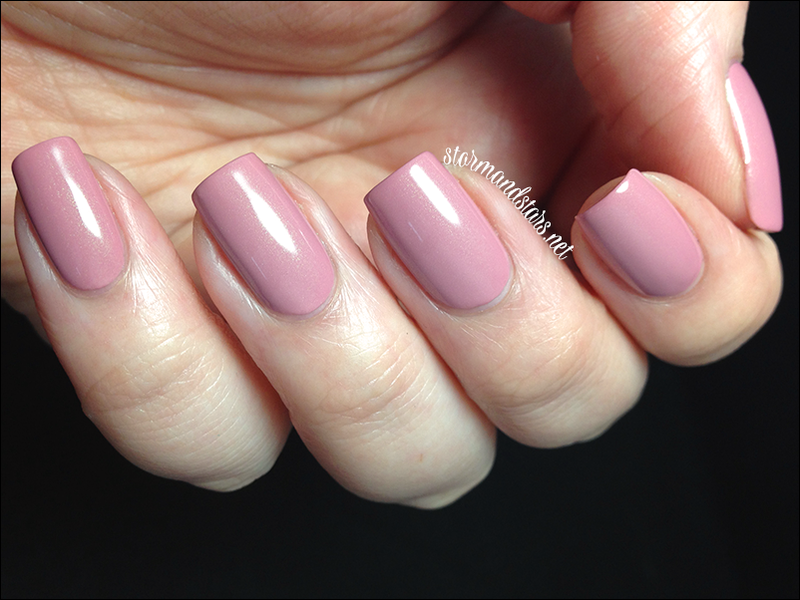 How rich and gorgeous is this shade?? I love Cult Nails cremes more than any other. The formula and coverage just can't be beat. I used just ONE coat of Radiance with no topcoat for these swatches. It practically painted itself and there was no need for a second coat or topcoat. I'm in absolute love with this one. I can't wait to do a gradient with it and Devious Nature, I think they'll look so great together! I love the color of this and it was the lacquer I was most looking forward to in the collection. The color plus that gorgeous shimmer? Yes please. Unfortunately I had a lot of trouble with the formula of Thrive. I did three very thin coats, waited about 10 minutes between each and still had some dragging and bare spots. I still like how it looks, but I was really hoping for a better formula. I highly suggest using an undie for this. Thrive is supposed to be slightly textured, but it is really just not a fully smooth finish. I used a generous helping of topcoat to smooth it out. What can I say? I just like my polish either fully textured or completely smooth. Last up in this three part collection is the very work-friendly Alluring. If you're looking for a work friendly lacquer with a kick then this is a great option. 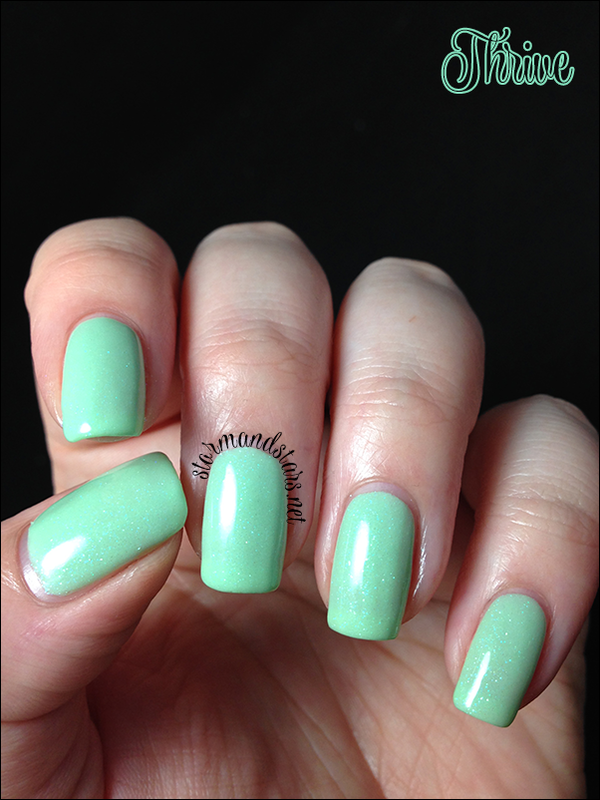 Alluring is a light mauve lacquer with a beautiful greenish shimmer. I love this shade on my skin even if it didn't photograph as well as I would like. This was another superb formula. 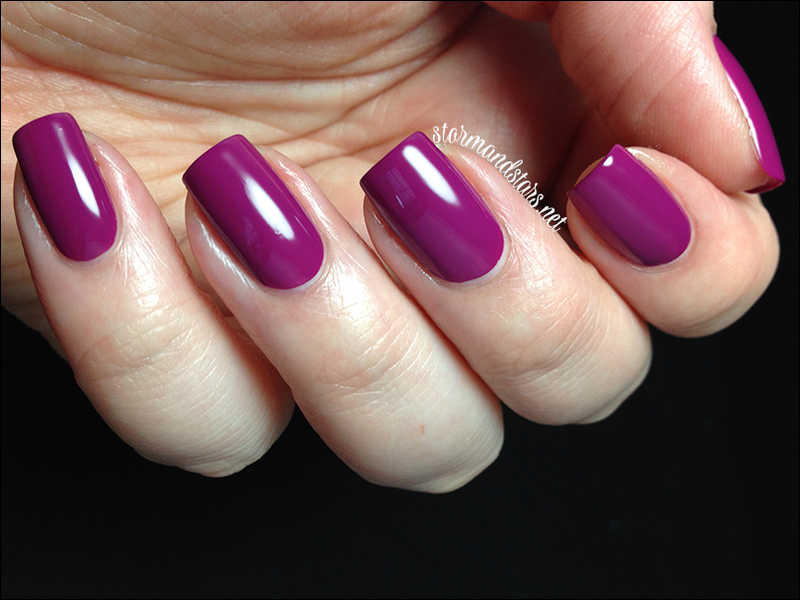 I used two coats of Alluring for these swatches with no topcoat. Super shiny and smooth all on its own. If you purchase between now and June 30th, you can use my coupon code STORM12 for $12 off when you purchase the entire collection.You can purchase the shades indivudually for $12 each or as a set for $36 before the coupon code. 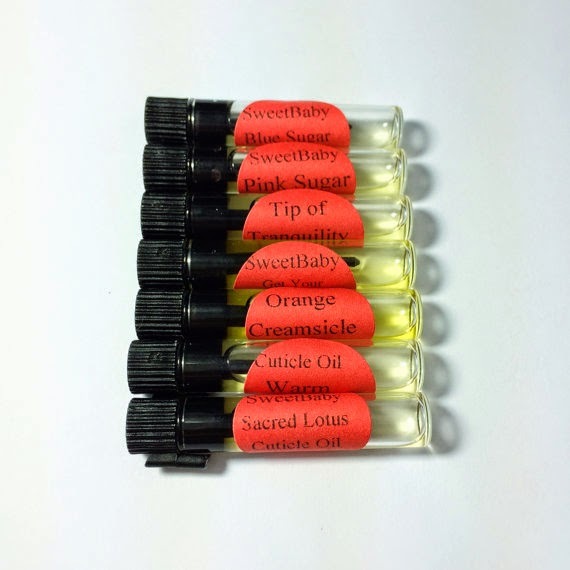 The second part of this review is the Sweet Baby by Donna cuticle oils. I have been using Donna's cuticle oil for quite some time now and it is the only oil I use anymore. I has healed my dry cuticles and made my nails strong and hydrated. I use her Namaste oil between every swatch when doing reviews and I always have a bottle of one of the other three frangrances I own with me. I was really excited to try out some of Donna's other scents and share my thoughts with you. I got a small bag of all the scents Donna currently carries in her shop and let me tell you, it was like Christmas. I didn't know which to try first. 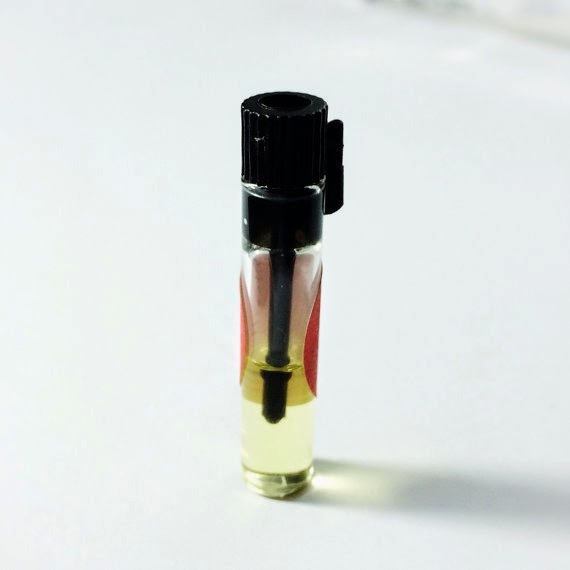 The samples come in a small glass bottle with a plastic stopper as seen below. Here are some of the scents and what I thought. Tip of Tranquility - A blend of Lavender, Sweet Orange, and Peppermint essential oils. Not something I would have purchased for myself based on the description, this scent is earthy and wonderful. The lavender and other scents blend perfectly and I will definitely be purchasing a bottle of this to use before bed at night. If you like lavender this is a must have. Sacred Lotus - Pear fragrance, lemon, and ginseng essential oils, plus a light touch of eucalyptus essential oil. I have wanted to try this for quite some time. I would say it is one of the stronger scents that Donna carries, but it really is lovely. This scent is so fresh and invigorating. A great pick me up or wake me up scent, I can see using this a lot in the mornings or when you need a little extra energy! Orange Creamsicle - This is a blend of sweet orange essential oil and vanilla fragrance. This scent actually started out as a custom order from my girlfriend and was so popular that Donna added it to her shop. It is sweet but not overpowering and really neutral. I would say that a man could easily get away with wearing this as well. Blue Sugar - A blend of Black Patchouli, Orange Peel, Sparkling Mandarin, Coriander Leaves, Star Anise and Venezuela Tonka. Blue Sugar is a men's fragrance that from what I hear a lot of women are enjoying as well! This was the first fragrance I reached for out of the samples and I absolutely love it. It would make a great gift to the well-groomed man in your life or even for yourself if you find yourself gravitating towards less feminine scents. Pink Sugar - A fruity blend of cotton candy, caramel, vanilla, strawberry, fig leaf, plums, mandarin, lemon drops and raspberry with a hint of soft musk and woods undertones. This is my favorite scent, hands down. If you've never smelled pink sugar, its like kittens and unicorns and rainbows and cotton candy and all things lovely. What can I say, I am hooked. These scents are all available both in the samples as seen above and in full size bottles like the one below. The full size bottle is 11ml and has a roller ball top that dispenses the oil so it doesn't get everywhere. Very handy. I have one on me at all times. You can purchase Sweet Baby by Donna in her Etsy shop. Don't forget to follow her on social media for news and annoucements as well as some wonderful nail art on her Instagram! I hope you enjoyed this collection and review!